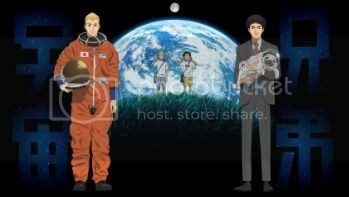 To follow his brother Hibito to the moon, Mutta will attempt to become an astronaut at the age of 32. Unaware of his own talent, Mutta chases his dreams to get back in front of his younger brother. I have always been interested in space travel. It's probably because I live on an island that the most interesting place for me has always been up. Growing up in the heyday of the US Space shuttle program, it was a draw to know that you just had to hop on a vertically stacked plane and take off. Every movie no matter how good or bad about space exploration is something that I will sit down and watch. I watched SpaceCamp and thought it was awesome. I know all the dialogue in The Right Stuff, hell I even watched The Cape (the 1996 series). I think I watched space shuttle launches in the day and caught the occasional night launch when Patrick Moore covered them on The Sky At Night. So when I read about A-1 Pictures translating Chuya Koyama's manga, Space Brothers, I wanted to see what the fuss was about. As with a lot of anime I watch these days, the reason I got into the series was not the reason I stayed watching it but the original reason remains ever present throughout the series. To explain, the show is about Nanba Mutta, a thirtysomething engineer working in the Japanese car industry has hit rock bottom. He just headbutted his boss, got fired and has no prospects. 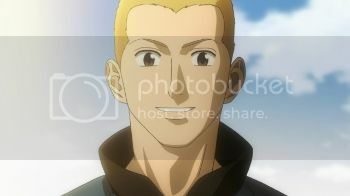 But Mutta is the brother of Nanba Hibito, an astronaut preparing for a mission with NASA and JAXA (Japan's version of NASA) to go to the Moon. So on the eve of Hibito beginning his final training, he sends Mutta a tape recording of Mutta promising to become an astronaut and go further than his younger brother. With nothing left to lose, Mutta applies to the JAXA astronaut programme and sets out to prove himself. Now, the show is about Mutta, no doubt, but the glue that holds Space Brothers together is the fact that so many people cross into Mutta's life and help him become a better person and force him to make better choices and actions. All of these people have their own path to chart and as the series develops we learns about Mutta's parents and his friends, allies and rivals and what makes them tick. Each and every time, Mutta may or may not learn about the facts of their lives. We the audience get to learn all of it. But the writers of the show treat Mutta as a character who needs to learn what he must to succeed but that he doesn't know everything and he knows enough to not ask anymore of them. So while the whole exploration of Space is the thing that brought me in, the story of Mutta and his family and friends keeps me here. Still, the space stuff is awesome. But it's hard not to watch this and not root for Mutta and the rest of the candidates as they struggle to reach the goal. Cheers were heard in my room as certain goals were attained that I can't spoil here. The relationship between Hibito and Mutta is the most important one, though. The two brothers couldn't be more different. Hibito is outgoing and rarely thinks before acting. Mutta is insular and often overthinks things to the point of becoming distracted. Both brothers have astronaut heroes they look up to but for different reasons. Physically, Mutta resembles their mother and Hibito looks more like their dad. Yet, for all their differences, they have the same desire to go into space and share the same dream. Mutta is the older of the two, as I said, and as such he constantly feels he should be the one going the furthest and setting an example to his younger brother. Despite the fact that Hibito is clearly capable of doing of these wonderful things, Mutta still feels he should be the big brother here. I felt echoes of both my younger and older brothers and how the Nanba brothers talk, act and react to each other. No, we don't want to be astronauts (well, I do) but we know when the other is spouting a line of BS. So when I watch this show with my siblings we always know the Nanba brothers will be our bedrock for the episode. Of all the characters that back up the Nanba's, three stand out ahead of the rest. Brian Jay was an astronaut who was a part of the NASA programme when Hibito joined JAXA and he and Mutta look up to him as an example of the best kind of space explorer. Azuma, a senior JAXA astronaut and trainer at NASA, also looked up to Jay when he came through the programme. He looks for the talents that Jay cultivated in him in the two brothers and finds them as well. Jay was killed in an accident while returning to Earth after a mission and his loss is still felt by all concerned. 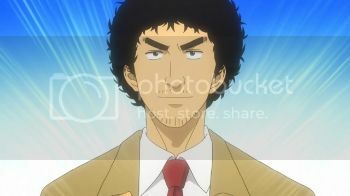 Kenji Makabe is a JAXA candidate that Mutta meets when he first applies and he and Mutta share the closest relationship outside of Mutta's one with Hibito. Kenji is a married man with a young daughter and has a good job and a happy life but he wants something more, dammit. He looks up and sees where he wants to be. Mutta seems to use him as a grounding for the dizzier moments being a JAXA candidate and we see possibly how Hibito will turn out in later years through Kenji. Serika Itou is a fellow candidate at JAXA and Mutta is completely in love with her. Honestly the fella tries to hide it but every time she's around he loses his cool. That said, he knows she's got her own goal and wants nothing more than for her to succeed. If it's possible though, Serika might be slightly less neurotic than Mutta. She's constantly hungry to the point of distraction. She obsesses about food in general and Star Wars for some reason and she nearly gets in trouble because of it but still just like Kenji and Mutta, her heart has a dream and destiny out in space that is relentless. These three characters define Mutta, and in turn Hibito, allowing the viewer to see that everybody has their own reasons for going into space. The show's science is backed up with help from NASA however the show's producers clearly state in the credits (in English no less) that NASA neither supports nor endorses the opinions expressed on the show. Still, the original creator and the show's writers cram as much science as possible. From explaining about Regolith (moon dust) to multi-stage rocket launches, you're learning little snippets of subjects that you probably wouldn't be interested in ordinarily. Sprinkled amongst the voice actors are real astronauts from JAXA, including one who recorded his dialogue aboard the ISS! The animation works and simply could be described as doing whatever it takes to get the story across and I'm fine with this. The highlight for the animation are the curious and very thought out opening and closing animations, these deserve special mention as they range from the inspirational to the bizarre but always with a space theme. The show itself is directed by Ayumu Watanabe, a director whose only other output this year has been Mysterious Girlfriend X which means the two series couldn't' be further apart in terms of content and execution. Really, when someone told me that I couldn't quite grasp it. One's about the boy and his relationship with a girl who likes drool and the other is well, you get the idea. Still, this means the gentleman has made two series that I can't wait to own on blu ray or DVD. 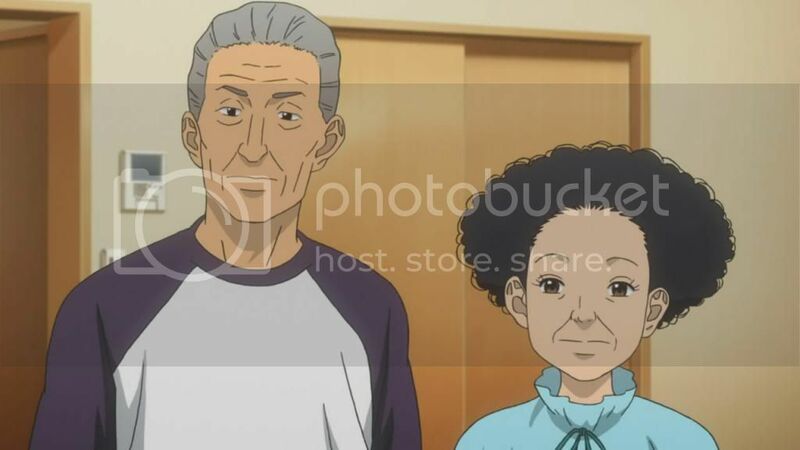 On top of a Toho produced live action movie, Space Brothers the anime is now capping off another twenty six episodes bringing us up to fifty two and news has come through that the show is being renewed for another season so we have lots to enjoy in this series. I dare you to watch some of it and not hum the rousing theme that Mutta has in the show in the in between times when you're not watching the show.